The economic order quantity (EOQ) model is the best-known approach for explicitly establishing an optimal inventory level. 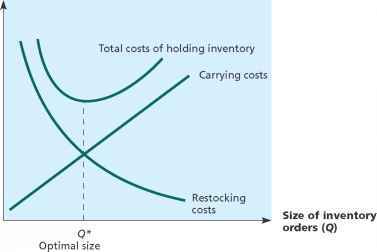 The basic idea is illustrated in Figure 21.4, which plots the various costs associated with holding inventory (on the vertical axis) against inventory levels (on the horizontal axis). As shown, inventory carrying costs rise and restocking costs decrease as inventory levels increase. 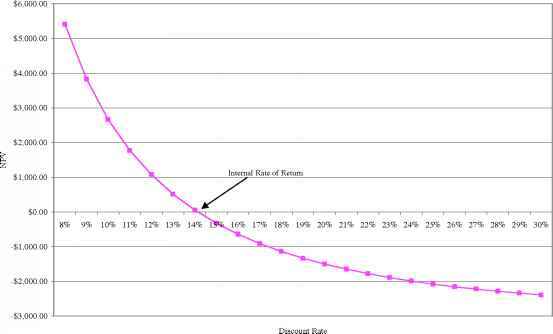 From our general discussion in Chapter 19 and our discussion of the total credit cost curve in this chapter, the general shape of the total inventory cost curve is familiar. With the EOQ model, we will attempt to specifically locate the minimum total cost point, Q*. In our discussion that follows, an important point to keep in mind is that the actual cost of the inventory itself is not included. The reason is that the total amount of inventory the firm needs in a given year is dictated by sales. What we are analyzing here is how much the firm should have on hand at any particular time. More precisely, we are trying to determine what order size the firm should use when it restocks its inventory. Restocking costs are greatest when the firm holds a small quantity of inventory. Carrying costs are greatest when there is a large quantity of inventory on hand. Total costs are the sum of the carrying and restocking costs.